I've had upside down tart loads of time, but last summer I had one of the best ever. Apples with a bite but not sour and a lovely pastry. I'm pretty sure that I happened to be looking over the Mediterranean with a cooling sea breeze on my face, and that this had made me a little more receptive to the cool sumptuous apple tart as I put the first bite into my mouth along with some plain vanilla ice cream!! I've been trying to recreate it ever since! As I've been looking around, I stumbled upon some factoids. Upside down tart made with apples or pears is a very old recipe from the Sologne (a region of north central France) and is found throughout Orleans. The name comes from the Tatin Sisters who ran a hotel-restaurant in Lamotte Beuvron whose version established their reputation. There are 35 species of apples, the species that gives us most of our eating apples is Malus x domestica, which can be subdivided into 4 categories of apple: Cider, Dessert or eating apples, Cooking apples, and Dual Purpose apples such as Granny Smith or Golden Delicious. Eating apples are used in this recipe. Put the sugar and butter in large sauce pan together and leave on high heat until the butter and sugar have combined into a golden brown caramel at this point there's still a bit of grain in the sugar (when making a caramel try and avoid stirring and sugar on the pan wall which will cause his crystallisation), add the apples. Juice from the apples will flavour the sauce. Coat the apples with it and leave the heat on until the mix starts to bubble, then simmer for 10 mins and take off the heat. Leave to rest for 30m or until needed. Use a slotted spoon to place the apple into baking dishes and keep the remaining sauce for topping. Cover the rolling pin, pastry (method here) and surface in flour, and roll out a rectangle that's an inch bigger than the baking tray. My baking dish was 25 x 18 x 4cm. Cover with flaky pastry tucking the pastry down the sides to create a lip when it's turned over and paint with a beaten egg. Whip the double cream, and depending on whether you decide to have rosewater cream or cinnamon cream, add the sugar and cinnamon, or the rose water to your taste. On taking the pie out of the oven, drain off any excess liquid there might be into the sauce that you set aside earlier. 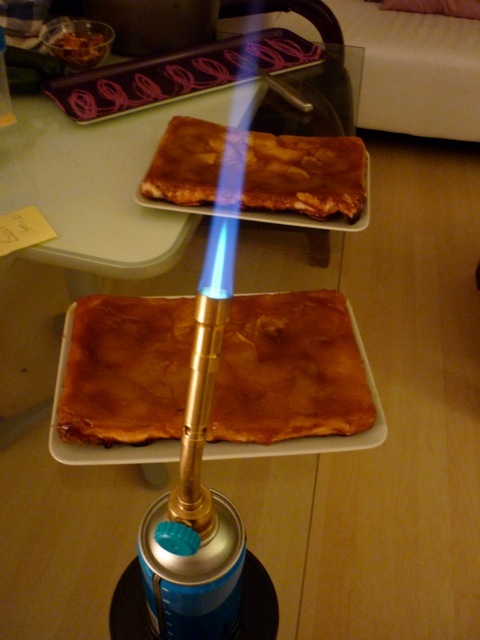 Place a large heat proof tray over the pie and turn it upside down to turn out the tatin. Sprinkle caster sugar over the apple and caramelise sugar and slightly char apple with a blowtorch. Bring the reserved sauce to the boil, simmer until the sauce is a lovely golden brown. Drip on the apple tatin slices and serve with a tablespoon of whipped cream! Tip: don't cook the apples too long or you'll have apple sauce rather than apple slices that still have a little bite to them. Tip: for the caramel sauce stir it as little as possible and try not to get sugar on the sides of the pan, both will cause the caramel to crystallise. Don't go a darker colour than mahogany or the sauce will be overdone. Tip: get a proper blow torch, you can get one with a handle and built in lighter for around £20. Don't bother with a pencil flame blow torch, you'll be there all day and your sauce will burn!! You'll be farting around so much you'll be liable to blow yourself through the kitchen window! Left: Good torch, built in piezzo electric light, works in all directions!! Right: Not so good, goes out when you point it down!! And quite tricky to light!!! Don't bother.